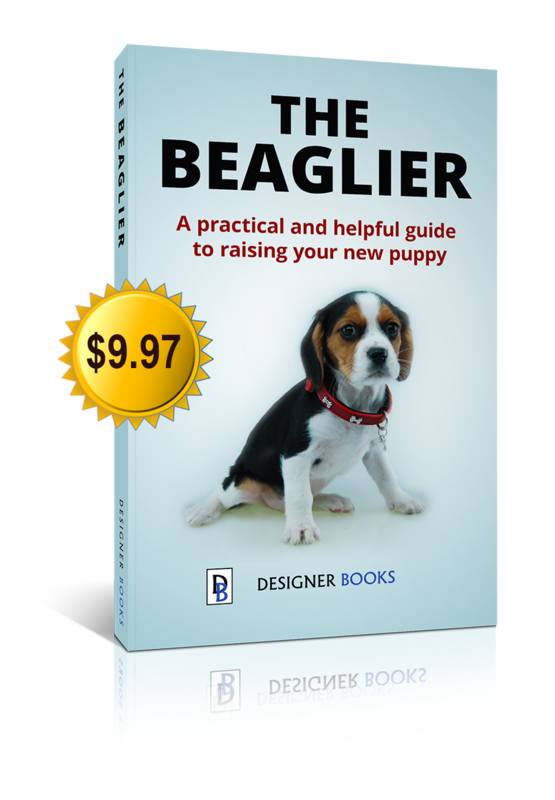 The basic care requirements for a Beaglier are the same for any other dog breed. They have a body that is well proportioned, so do not require extra care for features such as a giant size, flat face, long back etc. Like any other breed, Beagliers will need to be vaccinated by a veterinarian at 6, 12 and 16 weeks old and then a booster every year. They will need ongoing treatment for fleas and worms. This can be done with separate products for each of these or with the use of a single product that treats both fleas an worms at the same time. When using a flea control product it is best to use a “spot on” treatment. Spot on treatments are in the form of a liquid that is placed at the back of your dog’s neck such as Frontline. Do not use flea collars as most are ineffective in controlling fleas, and often cause many dogs, including Beagliers, to develop a skin reaction to the chemical sitting on their necks for weeks or months. If you live in an area that has ticks (especially paralysis tick) or where there is a risk of heartworm, preventatives are available. Consult your vet when you take your Beaglier puppy for their vaccination as to the best protection for your dog from these nasty parasites. Always follow the information provided with the product you choose to use to ensure that it covers your dog for the parasites needed and is suitable for the age and size of your dog. If you are unsure of which products to use, ask the seller or consult your veterinarian when you take your dog for it’s first check. Most Beagliers are not fussy eaters and will usually devour anything in their bowl! Continuing the same diet that your puppy has already been eating is important in preventing gastric upsets. Gastric upsets can become serious in young puppies if prolonged. Overfeeding at meal times can also lead to upsets but the main health risk to Beagliers is obesity. Their love of food can often lead them to becoming the vacuum of the left overs and gaining weight quickly. If you do notice that your Beaglier is packing on the weight, you need to cut down their portions at meal times. Being a relatively small dog breed, they are generally inexpensive to feed. Stick with a premium dry food if you choose to feed dry food as Beagliers should be fed small amounts at a time. Do not keep feeding your Beaglier puppy as much as he will eat as they will eat themselves to death. A premium dry food fed in small amounts will provide almost all the nutrition that they require. A couple of dollars more per week will provide your Beaglier puppy with a complete diet rather than poor nutrition on a lower grade dry food. This is especially important for growing puppies. Always consult the Beaglier breeder or previous owner as to what they have been feeding the puppy, quantities and number of meals per day so you can keep your new dog on the same diet. Your vet may recommend a different brand of food or different diet completely. In this case, a gradual change their diet is much better than a sudden change, so slowly switch over to the new food. It may seem strange to most Beaglier owners, but some Beagliers can be fussy eaters! Often, this is a learned behaviour where the dog has learnt to manipulate their owner into giving them the same food as the people in the home. If your Beaglier leaves food, do not offer other food (unless the dog is sick), but take the bowl away and do not feed him until his next meal time. Then offer his usual diet so he does not learn to refuse food to get the meal you are eating! Your Beaglier puppy will need to have a comfortable and safe place to call home. Many new Beaglier owners keep their dog inside the house for the first few days. Often the puppy has free access inside their home or to the backyard. While this might seem to be the nice thing to do for your puppy it can lead to disaster as there are many dangers to a curious puppy without supervision. Make sure that any area your puppy is allowed to roam is safe from items that could injure her. Remove any sharp objects and anything they may accidentally swallow from your puppy’s reach. If you are going to keep your Beaglier outside, you need to make sure that they have a warm, sheltered, comfortable and safe place to got to during any bad weather. This can be a kennel in a protected part of your backyard such as a patio, alfesco area or even in your garage. Check that your backyard is safe for your Beaglier as you would the inside but also check for any holes or gaps in your fences that she may escape from. Keep any nasty poisons or chemicals away from curious little paws and noses. Some dogs (and especially Beagle hybrids) just can’t help themselves from tasting things they really shouldn’t. Beagliers are a very adaptable breed that can tolerate a range of living conditions from apartments to rural life, and are happy to live as both inside and outside dogs. Grooming a Beaglier as a puppy will make things much easier for you to brush them as adults who stay still, rather than trying to run away as soon as the brush comes out. Long haired Beagliers do not need have their coat clipped short if you prefer a longer coat, and many owners opt for this. However, a longer coat will require more grooming to keep it free from tangles and mats and keep it looking it’s best. Beagliers do not need weekly baths as frequent washing will remove more of their coat’s natural oils that help to maintain a healthy coat. Beagliers only need to be washed about once per month at most and washing them more than once per week on a regular basis will lead to dry skin and coat. Always use a product specified for dogs and a puppy formula is more gentle and can be used throughout the dog’s life. They will need to have their nails clipped whenever they get too long. The nails should be off the ground when your Beaglier is standing still. Ask your vet to show you how to clip your Beagle’s nails if you are unsure. If you clip your Beaglier’s nail from a young puppy, she will soon realize that it doesn’t hurt, but just don’t cut down too far. Offering treats while they get a nail clip is a great way to convince them that nail clipping is great! A Beaglier’s ear flaps provide the perfect home for fungi and bacterial so her ears need cleaning each week to keep them clean and infection free. Use some tissue around your finger and clean where you can comfortably reach to remove any excess wax or dirt. You can use an ear cleaning solution in conjunction with the tissue for a more thorough clean or if there is a large build up of wax. Done often, ear cleaning takes little time and the dog gets accustomed to it. Again treats work a charm. Although Beagliers are animated and lively dogs in the home, daily walks are relished by this outgoing and family-orientated breed. They are a very social and intelligent breed and love the chance to get out and about for a walk. If a walk ends up at a local park or dog park with the opportunity to mingle with other dogs, even better. Beagliers do burn off some energy throughout the day keeping themselves amused and busy if they are provided with toys. A range of different toys to help keep them mentally stimulated and occupied while you are away from home is best. Beagliers don’t need very long walks when they do go out as each of your steps will be many more for them to keep up with you!) and a brief walk of about 30 – 40 minutes will usually suffice. Even a short walk however does provide this highly intelligent breed with a lot of mental stimulation. Beagliers use their noses to quickly gather information about other dogs in the area and what they have been up to (Facebook for dogs!). a great way to pack in a lot of running in a short time is to teach your Beaglier to fetch. This allows your dog to get a great workout, while you can be as active or as sedentary as you like!